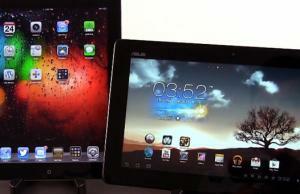 The iPad is cool, is sleek and it became a phenomenon, as it managed to become so popular so fast. Apple fans will just call it “magic”. One thing is for sure though: the iPad is not cheap. Thus, after paying 500+ bucks for one, I’m sure you would want to keep it safe; the best way to do so is by protecting it with matching accessories. And while there are many types of such cases, skins and covers, I for one believe the only ones able to match the looks and the style of the iPad are the Apple iPad Air leather cases. Finding them will be tough though, or at least finding the ones worth your attention (especially since these covers are pretty expensive and you would want to get only a high-quality one). 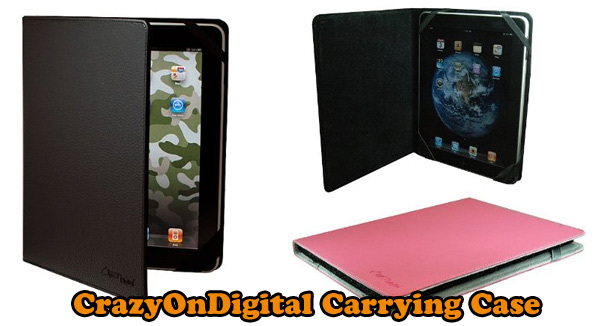 This post will help you a lot, as I’ve tried to gather in one place info on some of the best leather iPad cases, based on features and reviews from experts, but mainly from regular users like us, who bought them and posted their opinions online. See the list below for more info. The Simplism cover for you Apple iPad is more than an ordinary case. Of course, it will protect your device from scratches and smudges, but besides that, it also helps keeping the screen in a perfect shape and comes with awesome design (plus, it is available in several different colors). And unlike most covers, this one comes with a special enclosing for your gadget, covered by a durable and thin display protecting film. You can see more details in the picture below and you’ll also notice the nice looking stitching, the fact that all connectors and ports are accessible on the iPad and that you also get some compartments for papers, business cards, etc. However, there’s no place for a pen and the flap only swivel 180 degrees, so you can’t flip it completely to the back. All these make the Simplism leather cover a top pick. It is targeted mainly to business clients, so if you are one of them, the 60 bucks you would have to pay for it won’t sound too much. This case is just a fancy cover to dress your iPad with. Available in Black or Pink, it is made out of premium quality leather and looks very nice. Inside, it holds the case in one place with the help of 4 straps that entangle the device on its corners (see image for details). So, this case from CrazyOnDigital is pretty basic, but it does its job well, as proven by the fact that it is popular and scored some good reviews with its buyers. Plus, its price tag is way more affordable than the one of most other covers in this list. 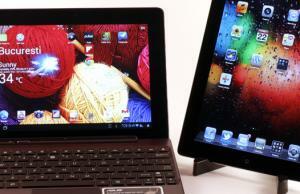 Another business style case for the Apple iPad is this one from Targus Hughes. As you can see from the picture, this is a slipcase in which the gadget slides like on an envelope. 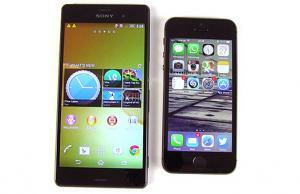 Thus, it will only be used for carrying the device, as you will have to get it out when you want to use it. Still, the case provides nice protection, having a very smooth inner padding, so you’re iPad won’t have any problems with scratches and it will even survive minor drops inside this Targus Hughes. The exterior is made out of high quality brown leather and you also get some extra compartments for papers and business cards. The flip comes with a magnetic lock so it will never open accidentally. All these come with a hefty price, but considering the aspect and the quality of this slipcase, I think it’s well worth the 60 bucks you’ll have to pay for it. 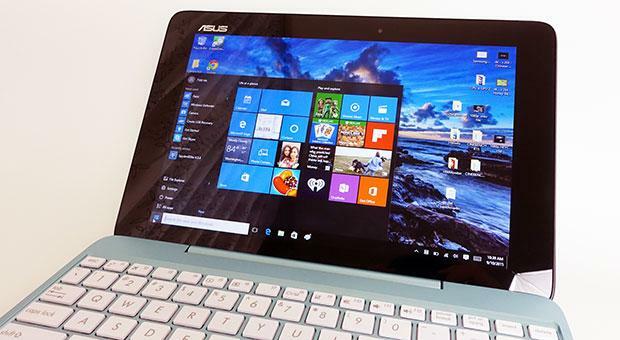 While all the cases above are great, they tend to focus more on on aspect and build quality. 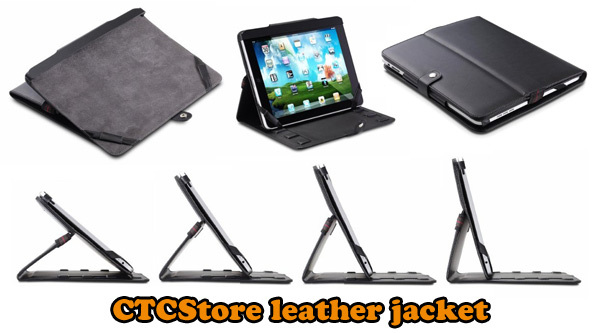 This CTCStore leather jacket for the iPad is a little bit different, as it also takes into consideration the practical part. Shortly, this case can also be used as an adjustable stand with several different angles. 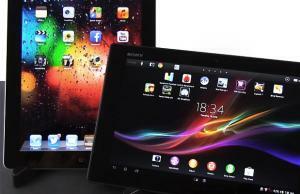 You can even use it to mount the iPad in your car. THis extra function is added without sacrificing looks. The exterior is made out of black leather, while the interior comes with a soft texture. The iPad is attached to the case with a system of straps and the case allows access to all existing ports when mounted on. Still, I do have to say that the CTCStore is not as professional looking as some of the other covers in this list. Still, because of it’s practicality, solid construction and discounted price, it managed to score very good reviews and marks with previous buyers. So that makes it an option to have when shopping for a leather iPad case. This CaseCrown case is versatile, that’s for sure. Made of high quality genuine leather, it is available in a different of different colors (black, pink, red) and with two different designs: with a vertical or an horizontal flip cover.And, in order to keep them locked, the cover comes with a magnetic latch. Plus, unlike most other cases in this list, it also comes with a screen protector covering the display and keeping it safe from fingerprints and scratches. Overall, the Case Crown is a nice pick, especially since it’s now discounted. Personally, i would go for the black vertical flip one. 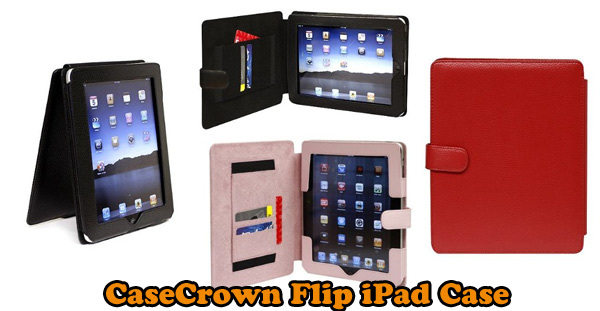 That’s about it with this list of best cases and covers for the Apple iPad Air . In time, more cases will make it in here, as they become available, but at least for now, these are some of the top picks, bringing a fair balance between price, features and good reviews from buyers. Of course, if you know other good iPad leather cases or have something to say about the ones presented in here, don’t hesitate to post a comment.